(ii) There are 29 questions in total. Question Nos. 1 to 8 are very short answer type questions and carry one mark each. (iii) Questions Nos. 9 to 16 carry two marks each. Questions Nos. 17 to 25 carry three marks each and questions Nos. 27 to 29 carry five marks each. (v) Questions No. 26 is value based question carries four marks. (vi) Use of calculators is not permitted. However, you may use log tables if necessary. Gauss’ theorem states that the electric flux through a closed surface enclosing a charge is equal to (1/Îµ0) times the magnitude of the charge enclosed. (i) As, Ï† = MI, with the increase in the distance between the coils the magnetic flux linked with the secondary coil decreases and hence the mutual inductance of the two coils will decrease. (ii) Mutual inductance of two coils can be found out by, M = Î¼on1n2Al, i.e. M âˆ n1n2, so, with the increase in number of turns mutual inductance increases. Resistance of a material can be found out by the slope of the curve V vs. I. 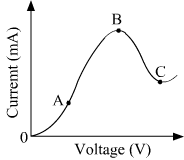 Part BC of the curve shows the negative resistance as with the increase in current, voltage decreases. Describe briefly, with the help of a circuit diagram, how a potentiometer is used to determine the internal resistance of a cell. (a) For a given a.c., i = im sin Ï‰t, show that the average power dissipated in a resistor R over a complete cycle is R.
A wheel with 8 metallic spokes each 50 cm long is rotated with a speed of 120 rev/min in a plane normal to the horizontal component of the Earth”™s magnetic field. The Earth”™s magnetic field at the place is 0.4 G and the angle of dip is 60Â°. Calculate the emf induced between the axle and the rim of the wheel. How will the value of emf be affected if the number of spokes were increased? 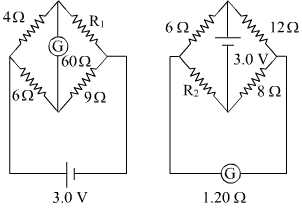 Figure shows two circuits each having a galvanometer and a battery of 3V. When the galvanometers in each arrangement do not show any deflection, obtain the ratio R1/R2. (i) Why is the current under reverse bias almost independent of the applied potential up to a critical voltage? (ii) Why does the reverse current show a sudden increase at the critical voltage? Draw a labelled ray diagram of a refracting telescope. Define its magnifying power and write the expression for it. Write Einstein”™s photoelectric equation and point out any two characteristic properties of photons on which this equation is based. Name the type of waves which are used for line of sight (LOS) communication. What is the range of their frequencies? (a) What is linearly polarized light? Describe briefly using a diagram how sunlight is polarised. One day Chetan”™s mother developed a severe stomach ache all of a sudden. She was rushed to the doctor who suggested for an immediate endoscopy test and gave an estimate of expenditure for the same. Chetan immediately contacted his class teacher and shared the information with her. The class teacher arranged for the money and rushed to the hospital. On realizing that Chetan belonged to a below average income group family, even the doctor offered concession for the test fee. The test was conducted successfully. (a) Which principle in optics is made use of in endoscopy? (b) Briefly explain the values reflected in the action taken by the teacher. 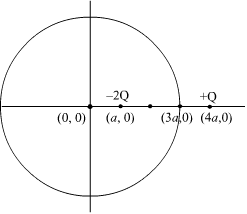 (a) Using Biot − Savart”™s law, derive the expression for the magnetic field in the vector form at a point on the axis of a circular current loop. (b) What does a toroid consist of? Find out the expression for the magnetic field inside a toroid for N turns of the coil having the average radius r and carrying a current I. Show that the magnetic field in the open space inside and exterior to the toroid is zero. (a) Draw a schematic sketch of a cyclotron. Explain clearly the role of crossed electric and magnetic field in accelerating the charge. Hence derive the expression for the kinetic energy acquired by the particles. (b) An Î±-particle and a proton are released from the centre of the cyclotron and made to accelerate. (i) Can both be accelerated at the same cyclotron frequency? Give reason to justify your answer. (a) Define electric dipole moment. Is it a scalar or a vector? Derive the expression for the electric field of a dipole at a point on the equatorial plane of the dipole. (b) Draw the equipotential surfaces due to an electric dipole. Locate the points where the potential due to the dipole is zero. (i) outside and (ii) inside the shell. Plot a graph showing variation of electric field as a function of r > R and r < R.
Using Bohr”™s postulates, derive the expression for the frequency of radiation emitted when electron in hydrogen atom undergoes transition from higher energy state (quantum number ni) to the lower state, (nf). (a) Draw the plot of binding energy per nucleon (BE/A) as a functino of mass number A. Write two important conclusions that can be drawn regarding the nature of nuclear force. (b) Use this graph to explain the release of energy in both the processes of nuclear fusion and fission. (c) Write the basic nuclear process of neutron undergoing Î²-decay. Why is the detection of neutrinos found very difficult?